Patreoners, if you haven't already, you've got until Friday to vote in this month's bonus art poll over on the Patreon site! I'm looking forward to seeing what the heck I'm going to be drawing. Our next update arrives on Friday! You'll want to be here, both for a brand new new comic and a new round of reader Q and A! If you've got a question you'd like me to answer, you can pop it in an email with "Q and A" in the subject line, or just toss it my way on twitter. I'm afraid I can't confirm or deny the validity of all your awesome Brain/Fridge theories... but, uh, let's just say these next few strips (and the remainder of this chapter) will are gonna get pretty interesting! A new week is upon us, team, and it's gonna be an interesting one over here in Sam and Fuzzy town. So let's kick it off with a gigantic double-sized comic. Pow! Meanwhile, I'm excited to say I've introduced some new rewards on my Patreon! Starting this month, I'll be doing two bonus character drawings based on backer votes. Some will be "Dress Up Stars" (S&F characters in reader-chosen costumes, ala our Sketch Offs), some will be "Pin-Up Stars" (S&F characters in fun and goofy pin-ups, ala my Headcanon books), and some will be "Pop Culture Stars" (non-S&F characters drawn in my art style). And all of 'em will be guided by the power of democracy! 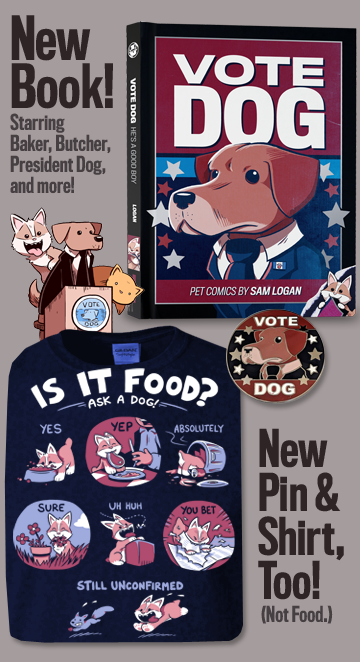 All backers at all levels will get to vote, and everyone will get to see the finished pieces. 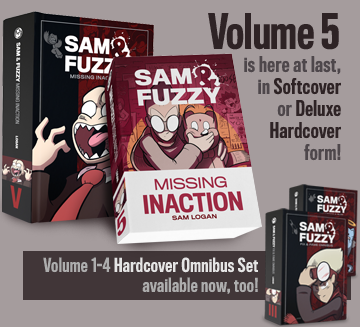 Plus, backers at the $5 level or higher will also get hi res, making of pics, and alternate (when applicable) versions of 'em as a part of the Sam and Fuzzy Extra monthly e-magazine of bonus goodies. If you're a Patreon backer, be sure to participate in our first vote, which is live until this Friday. Some of the results are currently very, very close! Meanwhile, from today until Sunday, I will be running a Sam and Fuzzy dealer booth over at Vancoufur! I've never tried to peddle my wears at a Furry convention before -- or indeed, attended any kind of Furry function whatsoever -- so I have absolutely no idea how it's going to go. But I'm hoping to see some friendly faces, and maybe find a few folks willing to commission a character drawing informed by my experimental new dice-powered Randomized Sonic OC Commission Generator. If you're curious to see what happens, I will, of course, be chronicling the experience in real time on twitter! And if you're going to be at the show, be sure to come by the booth and say hello! We return on Monday with a brand new comic strip. See you then, team!